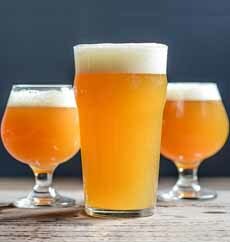  Juicy or Hazy IPA (photos #1 and #2 courtesy CraftBrewers.com). Juicy Or Hazy Pale Ale with a Hazy Double IPA. 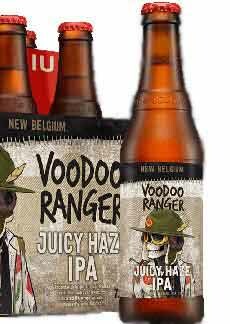 Since before the category was formally named, New Belgium Brewing Company of Fort Collins, Colorado has made Voodoo Ranger Juicy Haze IPA (photo courtesy New Belgium Brewing). Similarly, Weldwerks of Greeley, Colorado has produced Juicy Bits, a New England style IPA (now to be called a Juicy or Hazy IPA). The Brewers Association, the trade organization representing small brewers, has released its 2018 Brewers Association Beer Style Guidelines. These styles are those that have been informally called New England IPAs (New England-Style IPAs) or Hazy IPAs. The style additions were made in response to the continuing popularity and growth of India Pale Ale. The hazy component refers to a visual aspect that is cloudy, not clear (photos #1 and #2). German hefeweizen (“yeast wheat) is cloudy because the particular yeast strains used remain in suspension long after fermentation is complete. These beers are called bottle-conditioned (unfiltered), and the yeast particles are referred to as sediment. Belgian witbier (white beer, i.e. wheat beer) uses unmalted wheat, which creates the pearly haze. More recently, American craft brewers have been using pungent hops to meet consumer demand for more hoppiness. Polyphenols found in these hops can bind with oxygen or minerals in the beer, to create the haze. This is particularly common in heavily dry-hopped or unfiltered brews (source). A juicy beer is one that has aromas/and or flavors that are reminiscent of fruit juice. These flavors and aromas are also due to the type of hops (especially dry hops and late hops). There is no juice added to the beer. Rather, it is the selection of specific hops and how they are added to the brew that creates the fruity notes. A different term was needed, however, to not be confused with fruit beers which do have added fruit. European IPAs use hops that generate floral, herbal, pine and resin notes. Hops from the Pacific Northwest generated citrusy flavors. Now, in addition to citrus notes, craft brewers are creating tropical fruit flavors—mango, pineapple, papaya, plus some citrus.suggestion in the flavors and aromas, which can exude citrus, mango, pineapple, passionfruit—plus stone fruit flavors. Consider it a division between old school and new school preferences. WHY WERE NEW NAMES ESTABLISHED? “Juicy Hazy ales are very complex styles,” says style guide developer Charlie Papazian of The Craft Beer Association. The so-called New England variation of the American IPA deemphasizes hop bitterness, a key trait of the American version, often showcasing hop flavor and aromas that can be reminiscent of tropical fruit juice. As a group, “juicy or hazy” beers often exhibit relatively low perceived bitterness, high hop aroma and flavor and a softer texture than other types of IPAs. 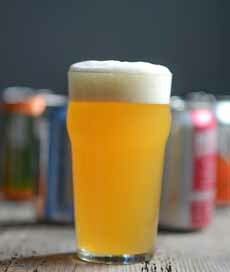 The New England IPA versions often are highlighted by some level of visual cloudiness or haze which is an effect attributed by a multitude of different ingredients and brewing techniques. To define the new styles, The Brewers Association received sought input from brewers and competition judges, as well as industry experts. Each category has specific technical specifications and sensory aspects. The three categories will formally debut on September 22nd, when the first awards in the categories will be given at the Great American Beer Festival.